The age of the Internet is both a blessing and a curse for aspiring musicians and bands. On the one hand, there is unprecedented access to getting your music out there and spreading the word about your band. All of which can be done without having to go through traditional methods like a record label. On the other hand, the amount of bands the public is given access to is gargantuan. It’s up to bands to be creative in their promotion and push to get their name out there, and this writer initially discovered Spanish upstarts Synlakross through a Facebook group. The band has been making their name across two albums at this point, with the latest being Death Bullets for a Forajido, which was released earlier this year. A combination of melodic death metal with some modern trimmings, the sound of Synlakross is a familiar one but it’s executed with finesse. With catchy hooks and aggressive riffs at the helm, the band has made a solid foundation for moving forward. Having themes for their albums helps to distinguish them from other acts as well, with Death Bullets containing a unique hook – a Wild West theme. We sent some questions to vocalist Patricia Pons to get to know more about the band in general, their western theme on the new album, and where they would like to go from here. Check it out below. Dead Rhetoric: What can you say of the beginnings of Synlakross? Patricia Pons: Well, all beginnings are hard, hahaha, and we aren’t different from the rest. So we had to work hard and save money if we wanted to grow up as a band – this part was hard to admit, because we started to plan a ‘professional band’ without money, support, etc. But here we are, growing and fighting every day. Dead Rhetoric: Your sound is rooted in melodic death metal, but how else would you describe Synlakross’ music? Pons: Yes, our sound is rooted in melodic death metal, but also in other styles, especially in Nu Metal I guess. We say that we do ‘killer metal’, killer/cool, you know? Because we think that our music rocks – it may not be the best, but it rocks! Hahaha. Dead Rhetoric: How do you think that the band has progressed since your first album, Melodichrome? Pons: Of course, at all levels, we play better, sound better. Since Melodichrome‘s recording we really grew up, and now we know what we want much more clearly. 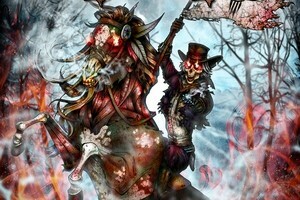 Dead Rhetoric: Where did the idea for a western theme for the new album come from? Pons: It started like a joke; we were talking about new ideas for design a logo that we could use no matter what thematic, and inside the ‘brainstorming’ Tiko said something about a cowboy’s hat on the logo for a Wild West album, and of course we started to laugh, but few days after we were working on it. Dead Rhetoric: Is it a theme that you would consider sticking with or was it something you just came up with for Death Bullets for a Forajido? Pons: No, we are a ‘storytelling band’ and we want to change the thematic with each album. Dead Rhetoric: You have a video for “Curly Wolves.” How important are videos for Synlakross in terms of getting your name out there? Dead Rhetoric: Have you begun any work towards future material at this point? Pons: Yes, since we finished the demos of Death Bullets For A Forajido we started to work on new material. Maybe we will be recording demos and making a pre-production of the songs in the winter. Dead Rhetoric: Is the band looking to sign with a label or are you okay with sticking to the independent route? Pons: No, we want to sign with a label. A real and serious label, by the way. Dead Rhetoric: What is the hardest part about being an independent band? Pons: Fighting against an invisible wall every day. There are tons of work on promotion, booking, etc, if you want to live from music, and it’s very hard if you don’t have any idea about it and have to learn on your own. Recently we got a manager and that means a new support and relief for the band – we are excited! Dead Rhetoric: How would you describe the Spanish metal scene? Pons: An emergent, promising scene. It’s gotten bigger since the last decade. Dead Rhetoric: What was a driving force that drew you to metal music? Pons: The passion, the different vocal styles – I loved growls since the first time I heard them, those killer riffs and brutal break downs, too many things. I fell in love with metal a long time ago and changed my life. I can’t imagine my life without it. 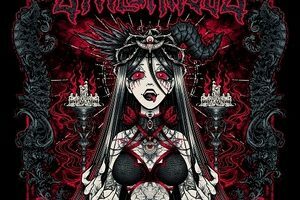 Dead Rhetoric: You have some upcoming dates with The Agonist – what’s a live show like for Synlakross? Pons: It means more promotion and a great opportunity to share your music with a big audience because sales forecasts are ‘sold out’. And also a great opportunity to have fun with them on stage and backstage – we are excited! Dead Rhetoric: What’s next for Synlakross? Pons: Still working hard, and an international tour. We want to be close of all of you!